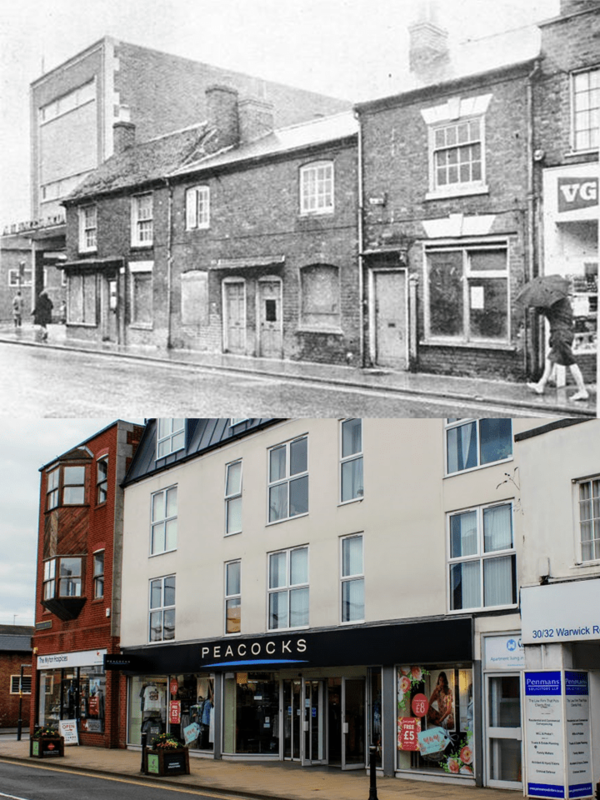 This Then & Now pairing shows the junction of Randall Road and Warwick Road, taken from the niche where the estate agents opposite is a little bit set back from the road compared to its neighbours. It shows the rank of cottages and shops that preceded the modern day building in which Peacocks now resides. Many such cottages along Warwick Road were demolished in the 1960s as it slowly became less residential and more commercial. Some of those that survived are now listed, such as 86-90 Warwick Road and 59-63 Warwick Road but listing status, vigorously campaigned for by post-War conservationists, came too late for many similar properties. As a consequence, much of the historic character of Warwick Road has been lost in favour of 1950s and 1960s flat roofed commercial units. By comparison, the High Street is pretty much intact. According to A Portrait of Kenilworth in Place Names (Rookfield Publications, 2015) by Geoff Hilton and Robin Leach, Randall Road was named in 1928 after Charles Randall, owner of the tannery. Rob Steward adds in The Inns and Roads of Kenilworth (Odibourne Press, 2000) that it was built along the line of an existing trackway called Monk’s Path, which ran from Goodrest Farm out in Rouncil Lane direction towards the Abbey, skirting the boundary of the Castle estate. Looking at OS maps from the turn of the 20th Century it appears that only the bottom part of Randall Road followed the Monk’s Path, which was joined to Warwick Road by the alleyway half way between Randall Road and Barrow Road. The early 1960s unit known as Warwick Corner, currently occupied by a branch of the Myton Hospice charity, has more recently been facelifted and had a bay window added as part of the conversion of its upper floors to residential flats. A single-storey flat roofed commercial property on the opposite side of Randall Road can be seen in the background of both photos, built on what was a greenfield site prior to the 20th century. Thanks to Chris Lillington from the Kenilworth Weekly News for permission to reprint this image and also to Robin Leach for providing it to KHAS.